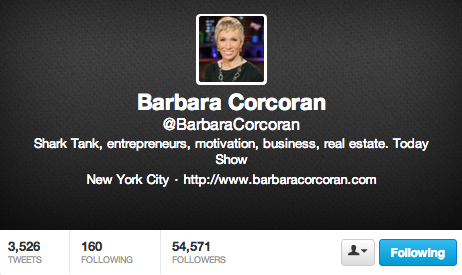 And voila, one hapless fangirl tweet for Barbara Corcoran! So with hashtags, you have to remember that what you’re tagging are topics of conversation, places, ideas….essentially hashtags act as a way to index things (kind of like Encarta, but less academic). So say I want to make a bold statement about my favorite show Shark Tank (if you read my other blog post, you know my opinion already). And voila! You’ve tagged your statement as a conversation relevant to females, investors, and people talking about Shark Tank! So now that you understand tagging, as your ‘homework’ go follow 5 people you find influencial. How to do you follow someone? Remember when we searched for Barbara earlier? If you look in the bottom right corner, you’re going to see a box which will read ‘follow’ and will be gray. Click this button, and it will be replaced by a blue button that says ‘Following’. This will allow you to receive their tweets, tag these people more efficiently, (and only if they follow you back) direct message them privately). If you currently follow me on twitter, tag #CityGopher and I will happily follow you back. I ask you to tag that, so that I will know that you are one of my blog readers, and so I can follow you back in case you have questions! Congrats on your SITS day! Great guide you’ve got here. I’ll definitely send it to some newbies. Happy belated SITS day! I’m new to twitter and this was helpful – I’m going to go check out part 1 now. Thanks!